Final Call for Summer Special! “Working with Jan the first time changed my life, and that happens in each session! I’m so grateful to have someone I can trust to help me transform into the best woman I can be.” —Becky M.
Don’t miss out! Final three days! 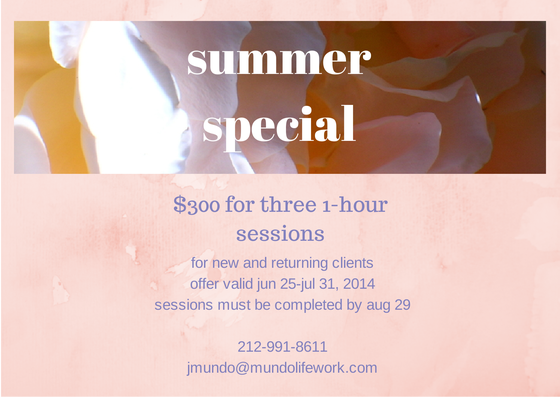 Purchase your Summer Special—three 1-hour sessions for $300—by 7/31 and use by 8/29/14. Experience instant and long-term transformation, whether it’s Somatic Bodywork and Coaching, Mundo Method hands-on headache treatment, or body-mind headache prevention training. My studio is on New York City’s Upper East Side but if you can’t make it here, I can work with you extremely effectively via Skype, FaceTime, or phone. Soon to follow: some very special announcements and a story.